PARIS/ADDIS ABABA (Reuters) - The grounding of Boeing's 737 MAX jets after the crash in Ethiopia has had no immediate financial impact on airlines using the planes, but it will get painful for the industry the longer they do not fly, companies and analysts said on Friday. 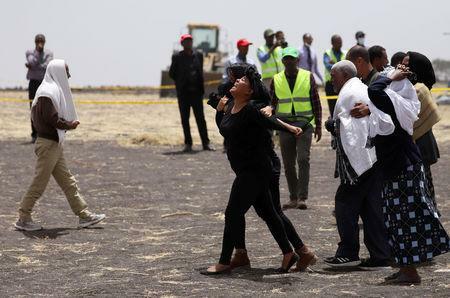 Ethiopian Airlines Flight 302 crashed soon after take-off from Addis Ababa last weekend, killing 157 people, the second such calamity involving Boeing's flagship new model after a jet came down off Indonesia in October with 189 people on board. Regulators have grounded the 737 MAX around the world, and the U.S. planemaker has halted deliveries of the several thousand planes on order for a model intended to be the future industry workhorse. Air Canada and United Airlines on Friday became the first major carriers in North America to warn of negative financial implications to business as a consequence of the grounding of the Boeing planes. Canada's biggest carrier Air Canada suspended its 2019 financial forecasts, while United Airlines, the No. 3 U.S. carrier, said it would see an adverse effect on its operations if the jets remained grounded heading into the peak summer travel season. U.S. bank Citi said it expected the grounding to eat into the profits of Southwest Airlines, which operates the world's biggest 737 MAX fleet, leaving the carrier facing a plane shortage and likely passenger compensation costs. In the two crashes, pilots asked to return minutes into flight. "It looks like the Lion Air, because the flight only lasted for six minutes," Ethiopian Airlines Chief Executive Tewolde Gebremariam told state Chinese state news agency Xinhua on Friday. "There is clear similarity between our crash and the Lion Air crash." Reuters was not able to reach Gebremariam for comment. A link between the two accidents makes blame more likely to lie with Boeing and less likely with the airline. Parallels between the twin disasters have frightened travelers worldwide and wiped billions of dollars off Boeing stock. U.S. authorities say information from the wreckage in Ethiopia and data on its flight path show some similarities. Two sources said investigators retrieved a piece of a stabilizer, which moves the nose up and down, set in an unusual position - similar to that of the Lion Air plane that crashed in Indonesia. Pilots were waiting anxiously for results of the investigation. "Looking at the crash site photos, the aircraft appears to have nose-dived," Paul Gichinga, former head of the Kenya Airline Pilots Association, told Reuters. "The pilot must have gotten some sort of indication that maybe the airspeed was unreliable or something and decided, instead of climbing and going to sort out the problem up there, the best thing was to return to have it sorted." U.S. President Donald Trump spoke by telephone on Friday with Ethiopian Prime Minister Abiy Ahmed about the crash, according to the White House. "The president reiterated his sorrow over the loss of life and underscored America's commitment to work with the government of Ethiopia – a longstanding partner and friend of the United States – and international civil aviation authorities to determine the cause of the crash," the White House said in a statement. Boeing, the world's biggest planemaker, has said the 737 MAX is safe, though it plans to roll out a software upgrade in coming weeks. Despite pausing shipments, it continued to produce at full speed at its factory near Seattle. French authorities have the flight data and cockpit voice recorders, though Ethiopia is formally leading the investigation and U.S. experts are in Paris and Addis Ababa too. First conclusions could take several days. The New York Times said the captain, Yared Getachew, initially reported a "flight control" problem in a calm voice before asking to return in panicked tones three minutes into the flight. "Break break, request back to home," he told controllers, the newspaper reported. The jet initially flew below the minimum safe height for its climb, then once at higher altitude was oscillating up and down by hundreds of feet, all at abnormally fast speed, the Times said. It then disappeared from radar over a military zone and lost contact with controllers five minutes after take-off. In Ethiopia, relatives have been visiting the charred and debris-strewn field to pay last respects. The victims came from 35 nations. Diplomats fear trucks and excavators at the site could be destroying vital evidence, while some policemen have been taking selfies inside the security cordon. Israeli Ilan Matsliah came quickly to Ethiopia thinking it would be quick to find the remains of his brother for burial in accordance with Jewish tradition. "More than 24 hours is a problem for us. But I have been here for more than 96 hours," the 46-year-old told Reuters. "We are now stuck in the same place, the same as Monday. We are very emotional." With heightened global scrutiny, the head of Indonesia's transport safety committee said a report into the Lion Air crash would be speeded up for release in July or August. A preliminary report focused on maintenance, training and an anti-stall system. Elsewhere, a potential new Chinese order for more than 100 jets worth well over $10 billion was put in doubt. Legal experts said even non-U.S. families of the Ethiopia victims may be able to sue Chicago-based Boeing in the United States - where payouts are larger - as eight of the dead were American and plaintiffs may argue liability hinges on system design and safety decisions made by executives.